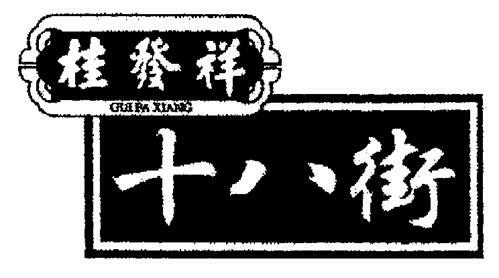 On Friday, July 18, 2003, a canadian trademark registration was filed for GUI FA XIANG SHI BA JIE & DESIGN by TIANJIN GUIFAXIANG 18TH STREET 32 DONG TING ROAD, HEXI DISTRICT, TIANJIN, CHINA . The Canadian IP office has given the trademark application number of 1184936. The current status of this trademark filing is Registration published. The correspondent listed for GUI FA XIANG SHI BA JIE & DESIGN is WS LI of 5194 Killarney Street, Vancouver, BRITISH COLUMBIA, CANADA V5R3V9 The GUI FA XIANG SHI BA JIE & DESIGN trademark is filed in the description of Fried crisp dough. .
(1) - Fried crisp dough.